Disclosure of Chemicals | Texland Petroleum, L.P.
Texas has been a national leader in disclosure requirements regarding chemicals used in hydraulic fracturing. Under current regulations, Operators must report all chemicals used in a particular frac job with the FracFocus chemical disclosure registry for any well drilled after February 2012. The state reporting requirements are sufficient to provide the residents and City Council with any information they may desire with respect to the chemicals used. Further, accurate advance reporting is not feasible because the composition of materials may change depending on conditions encountered in a particular well. 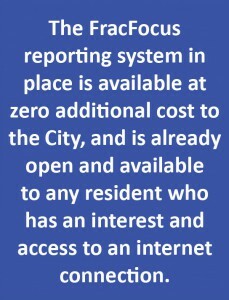 Given that EPA and the TCEQ have thoroughly analyzed this issue, created an intensive reporting requirement, and implemented a method of reporting, it seems logical that the City rely on the FracFocus structure rather than create its own.